It’s weird how often things repeat themselves. A month ago, I experienced the bustle of Shanghai Pudong Airport for the second time. 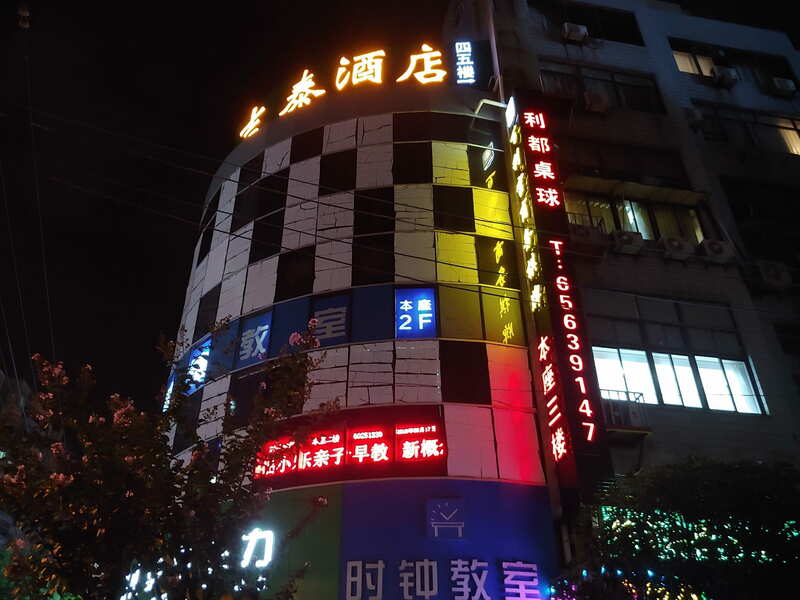 Three years have passed since my first encounter with the place, and the advertisements, people, and weather might be different, but there are always constants. Let’s take scale, for example. If I were to say that Shanghai is “big”, I feel like I’d be falling right into a cliché. It’s a city. It’s big. Duh. Clichés exist for a reason though, and the minute the other study abroad students and I were shuttled from the airport to downtown, I remembered why this one sticks around. Shanghai is crammed with skyscrapers. They take up so much of your view that glass, metal, LEDs, and neon are primordial components of the environment. 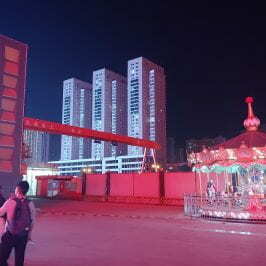 The infrastructural development of Shanghai is relatively new, yet it has asserted itself by dressing up in electricity . Late evening light-shows spark across the Bund, projectors mottle sidewalks with logos and slogans, streetlights glare at the clumps of trees lining the streets. 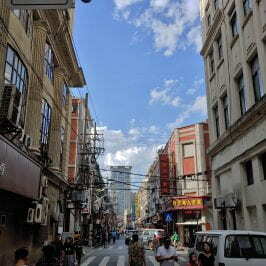 Shanghai has grown very comfortable with modernity. She wears it well. Alright, I’m going to continue being the hack that I am and go for the second cliché. Shanghai is also a city that never stops moving. This is a statement I might’ve disagreed with during the first few weeks here, but a single visit to my dormitory’s roof changed my tune real quick. I’ll get to that in a second. Before that I want to address how quiet things can get around here at night. Past midnight or so, even on weekends, most public transportation stops operating. I guess the assumption is that if you’re not at a nightclub or something, you’re asleep. Walking down these streets with so few people around only reinforces how big this city is. All of these closed shops and dark skyscrapers seem to hone in on whoever’s left wandering, because of course Shanghai never loses an opportunity to remind you of its presence. I really enjoy that feeling of wandering around in the silence. 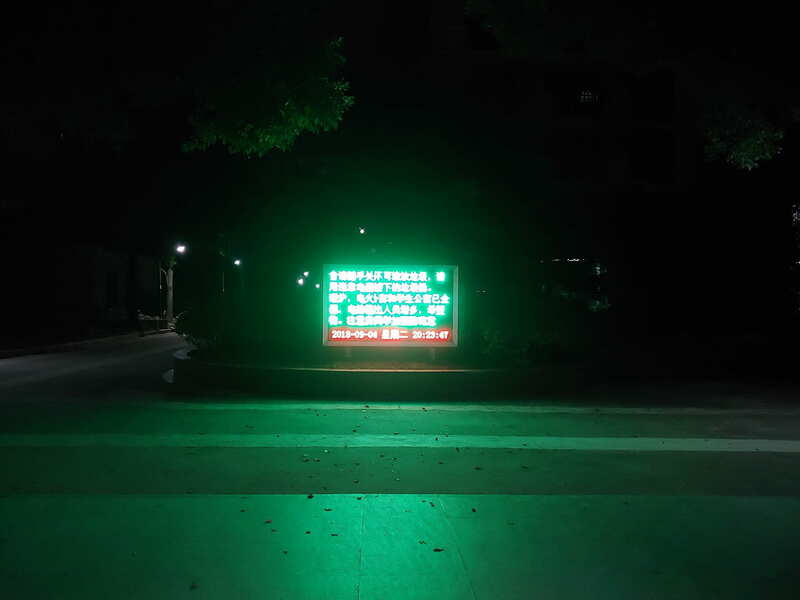 This sign at the entrance to the dorms presents announcements and welcomes late into the night. Over the summer, my friend James and I would embark on similar walks back at Amherst. By day, Amherst and Shanghai are pretty much polar opposites of each other. By night, a lot of their differences wash away. Off campus, in the different neighborhoods of Amherst, silence padded the shadows. James and I sailed from one streetlight island to another. Every breeze set webs of light and dark into spirals. And just because of how few people there were, every interaction mattered. One time, we saw some other people making their way. 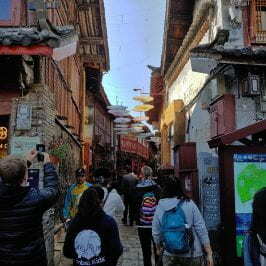 We weren’t on converging paths and they were so far that we couldn’t distinguish any facial features, but we all paused. There was a moment of connection across the streets, and we let that connection live. Let it slowly fade away. Then we went ahead. “It’s like Fallout or something,” I said. Basically yeah. Shanghai carries over a lot of the same energy, except it’s channeled differently. 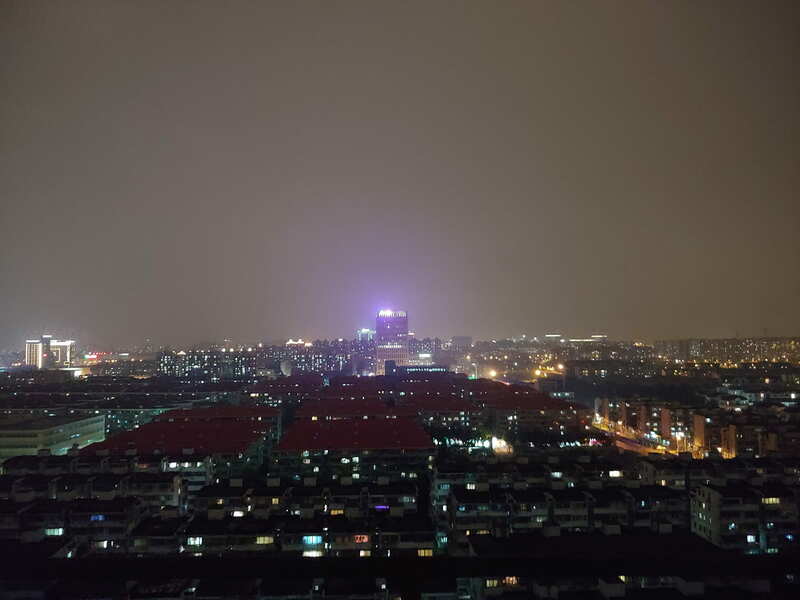 If Amherst’s evening silence is like Fallout, then Shanghai’s evening silence is like…actually, I’m not completely sure yet. I’ll get back to you on that. Of course, the nightly peace is very relative. Depending on where I’ve been, there are nearly the same amount of people around on the streets as there would be during the day. From my (very few) experiences so far though, things slow down. Which brings us back to the cliché I threw out a few paragraphs ago. In what way does Shanghai keep moving? It started with a trip to the dorm’s roof. I hadn’t even known that it was accessible until some new friends from my program took me up there. It was our second Friday night in the city. We were getting ready for a night out, waiting for a cab to pick us up. If we were going to be standing around and spacing out, we might as well have done it while spacing out at something interesting. So we took the elevator that creaks and shudders in all the wrong ways to the 18th floor. Our dorm’s roof access is very safe, with high borders along the building’s perimeter and all. It’s actually a common thing for different students living in the building to check out the view from there. I understood exactly why my friends wanted to go up there when I looked out from our vantage point. Shanghai from the roof was everything I had experienced from street level, spliced into a collage. Individual buildings lost their definition and merged into clusters of winking lights. Fog made the distances tangible. I didn’t have to look far to see where it all – the cars, skyscrapers, glowing signs – all blurred into a gray. The type of gray you only find in cities. Midnight black seared with fluorescence. One of my attempts at capturing that “city gray” on camera. Before I arrived in Shanghai, I tried my hardest to write a description that would capture that type of shadowy limbo. My failed attempts revolved around some sort of metaphor involving stars drawn so close to a city that they fell to Earth, absorbed by concrete grids. It was dumb. A friend here phrased it so much better. While riding in a bus observing that City Gray, he commented that the lit windows of the towering buildings had become our new night sky. That comment alone brought me right back to the struggle of capturing that thought – and of what I was trying to capture in the first place. I mean, I’ll probably be chasing after elusive descriptions again in no time. It’s weird how often things repeat themselves.